Does anyone remember lemon “Creamola Foam” – soft drink crystals from umpteen years ago? Well, that to me, is the scent of winter-flowering honeysuckle. It takes me right back to my childhood! I must say, the tiny honeysuckle flowers, with their delicate, fresh, lemony scent is the plant’s strong point. It is a vigorous grower, with a sprawling habit. Not a plant of great beauty for the rest of the year and it does need to be kept in check. But please don’t let that put you off! It does hang on to some of its leaves overwinter (it’s semi-evergreen). And the scent is hard to beat! The one pictured is Lonicera fragrantissima, which I have in the back, as part of my scented shrub border – along with other winter gems! 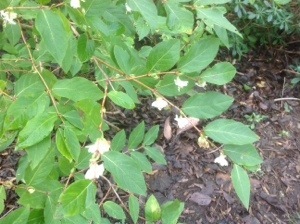 I have another variety, Lonicera purpusii, which I have as part of a flowering hedge in the front garden. It responds well to the clipping, becoming much denser. At the moment, as well as flowering, it has retained its leaves and is still perfectly green – a bonus for a hedge. An interesting new way of using them? Definitely worth a consideration! This entry was posted in The Scented Path and tagged Creamola Foam, hedge, lemon, Lonicera, scent, shrubs, winter on January 28, 2014 by thelonggardenpath. Yet again a casual trip to the garden centre has resulted in me leaving with two purchases – two new scented shrubs – of course! Two new Sarcococcas – my current favs. This brings my count now of these wonderful small shrubs up to five. Otherwise known as Christmas Box, they have a similarity to this well-known old faithful. They are very well behaved little shrubs. They are well adapted to shady conditions, with the small glossy leaves reflecting light. But there is more to them than being an evergreen stalwart of the shrub border understory. At the height of winter, when all can still appear dormant and dreary, they come into bloom. The flowers themselves may not scream at you, being small and insignificant, but the scent they emit is anything but! I use them as edging plants in my scented shrub border. They need little to no maintenance and don’t need the clipping often required of box edging. As they are such easy to grow plants, that don’t easily outgrow their desired area, it’s not surprising that my collection keeps growing! 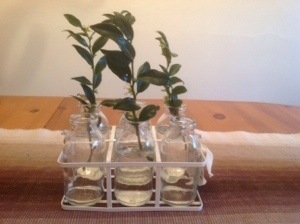 And, another plus, is that their branches can be cut to bring indoors – as you can see from my previous posts! This entry was posted in The Scented Path and tagged Garden scent, sarcococca, shrubs, winter on January 25, 2014 by thelonggardenpath. I adore scent in the garden! In fact, I’d go so far as to say a garden without scent is incomplete – somewhat lacking. You won’t be surprised then when I tell you that our garden revolves around it and largely, dictates my choice of plants. 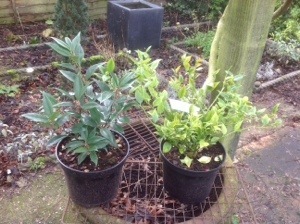 If a trip to the nursery reveals a new, scented plant, there is no way I can leave empty handed! After my “walk round the estate” earlier, enjoying the scents of our winter flowering shrubs, I am urged to share these with you, throughout the year – hence “The Scented Path”. 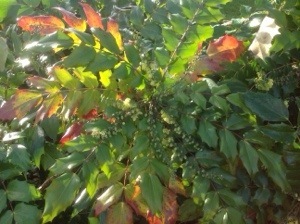 Let’s start with my Mahonia above. This has been flowering now since October, it’s tiny daffodil-like flowers emitting a lovely scent of lily-of-the-valley. It’s an evergreen, architectural shrub, with large,sharp, holly-like leaves that sometime take on autumn tints. The flowers give way to racemes of blue-black berries and so has all year round interest. And nil maintenance! This entry was posted in The Scented Path and tagged Garden scent on January 14, 2014 by thelonggardenpath. January blues?….I don’t think so! I’ve been told that January is supposed to be the gloomiest month of the year, with “Blue Monday” (either the 6th or 20th, depending on your sources) as the most depressing day. O.K. So the mirth and mayhem of the festive season is over, and we’re faced with months of darkness and drab weather, before spring lifts our spirits again with the certainty of long, hot, summer days ahead! (Hmm!!). You’re probably tempted to head back to bed and bury yourself under the duvet to sleep through it. Don’t rush off though! Look at it another way. The hectic madness is over and there is a refreshing peace and tranquility to replace it. And as if that’s not enough, as a gardener, this is the time of freshness and renewal. Today has been the perfect example. I have just spent some time in my garden (aka “The Estate”!) and it has been in no way gloomy or depressing. The sun has been shining in a clear, blue sky giving warmth to an otherwise frosty day. 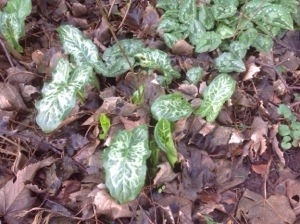 Already the bulbs are starting to force their way through – I spotted snowdrops, crocuses and narcissi. And I counted five shrubs in bloom, pumping out their gorgeous scent all through the garden. So already I’ve got cutting material to bring indoors. (My Xmas pressy getting its first use!) This I must share! How can anyone with a garden be blue in January? This entry was posted in Uncategorized and tagged Milk bottles on January 14, 2014 by thelonggardenpath. It’s the perfect time of year to take the plunge, and finally put pen to paper, so to speak! Why not record my thoughts and ideas and whatever else I feel like recording! But before I launch myself headlong into my plans for the coming year (which, incidentally, haven’t actually materialised yet!) 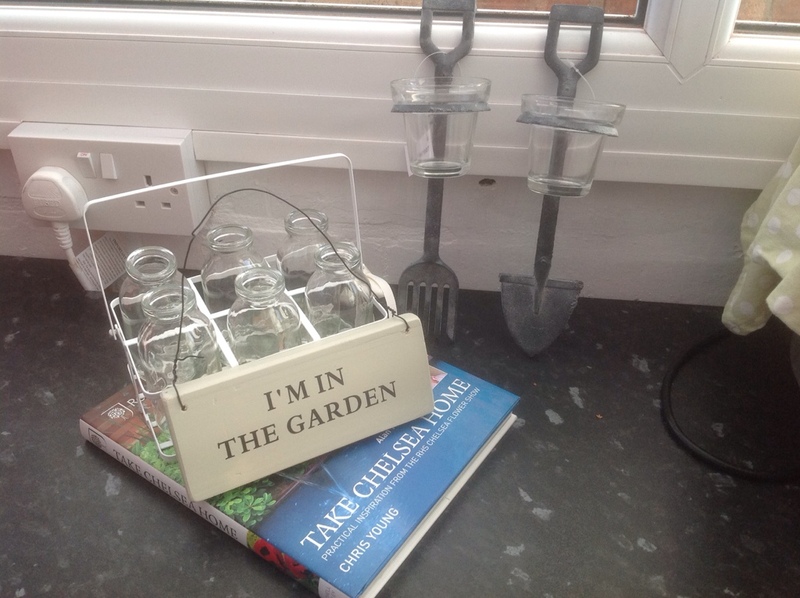 I want to revel a bit longer in some of my amazing garden-type pressies! Can’t wait to fill them with the first spring or even, hopefully, winter flowers! This entry was posted in Uncategorized and tagged Milk bottles on January 2, 2014 by thelonggardenpath.